Welcome to Title Talk, 08.2018. Yay ME!! Know why? Because I am hanging in with the commitment I made back in January (or maybe late December?) 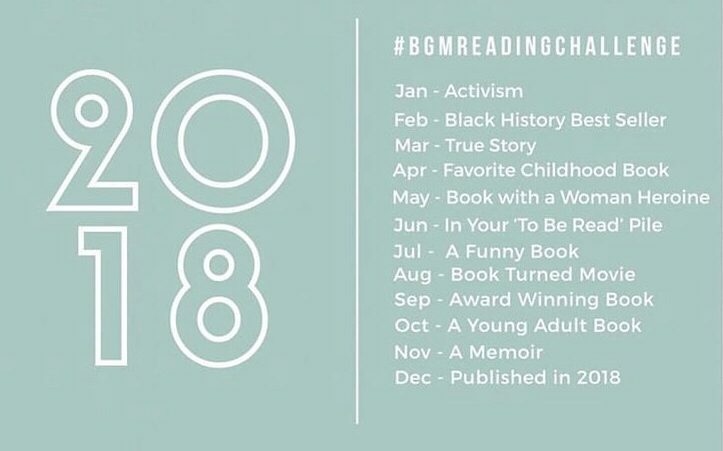 to participate in 2 reading challenges. And for kicks, I decided to host my own virtual book club. The Summer 2018 Virtual Book Club. 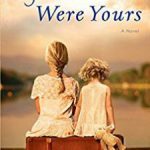 I think all of us have finished up our second book, Before We Were Yours by Lisa Wingate. A book that I absolutely loved. 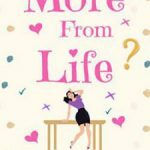 A few of us are finishing our third book, More From Life: A Funny and Feel-Good Romantic Comedy by S.J. Crabb, which we chose after deciding we needed a lighter read for a change. 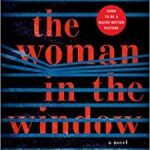 And most of us have begun book numero cuatro The Woman in the Window by A.J. Finn. If you are looking for a low pressure/no pressure book club to join, come read with us! Now onto the book I read for this month’s Book Girl Magic prompt, “a funny book”. Today’s review is one of those 2-fer deals. 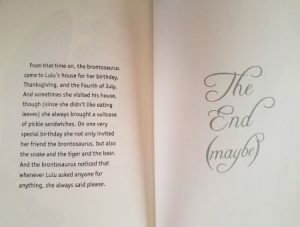 In preparing for this post, I realized there is a sequel to the original book, Lulu and the Brontosaurus by the winning combo author Judith Viorst and illustrator Lane Smith, I had planned to share. 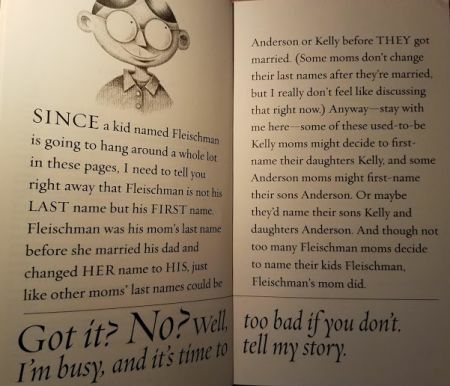 Seemed like a great excuse to order and read another funny children’s book. So I took full advantage. 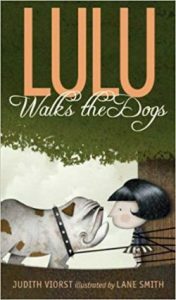 Ordered Lulu Walks the Dogs. 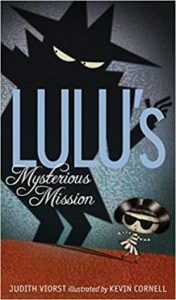 And, if I wasn’t so broke, I would have gone full-on crazy and ordered the third book in the series, Lulu’s Mysterious Mission. Gotta start playing that lottery. Author Judith Viorst inserts her personal opinion in the form of hilarious parenthetical asides throughout the first book. 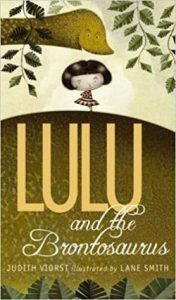 And when Lulu finally stumbles upon her new long-necked friend, she has also met her match. The the design of the book is engaging with the clever use of fonts and type size for emphasis and attention. And the chapters are often no more than a page or two long. Which can be such encouragement to reluctant, struggling readers. 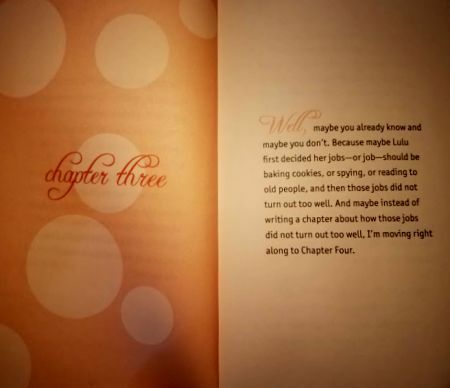 In the case of Chapter 3, Viorst decides to skip it entirely. Yet the author has a Chapter 8, Chapter 8 1/2 and a Chapter 9. The book concludes with 3 final Chapter 13s. You’ve gotta love it. Kind of like those popular “you choose” books where the reader decides which way the book should end. In this case, though, Viorst isn’t completely satisfied with the way she writes the first final Chapter 13, so she writes a second Chapter 13 and then a third. 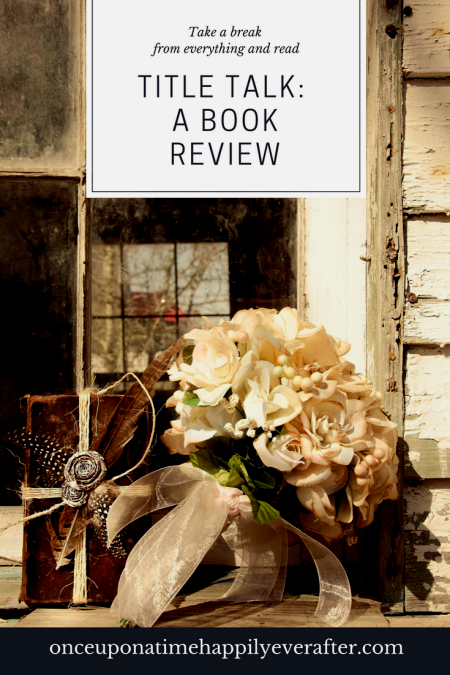 Not only is this book entertaining but it also demonstrates how even award-winning authors often write and rewrite and edit their writing. Even as a part of a published book! I am currently reading this aloud before bedtime to Cadence via Face-time. We are on Chapter 5 and read all of that in our first night. Imagine how a struggling reader would feel to say he read 5 chapters last night. Heck, that would even make this old librarian feel accomplished. Will be sending these books to a dear teacher friend of mine for her shiny new class of third graders to enjoy. Hope to read the second and third books with my Cady, too. If you have littles who love dinosaurs and feisty characters who are just a little too big for their britches, this series is for you! For them. Do you have a favorite humorous children’s book? Are you a fan of the Dr. Seuss-type humor, or maybe more a fan of the antics of author Jack Gantos’s mischievous Rotten Ralph? 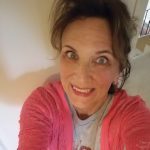 Would love to hear your suggestions for humorous children’s books. And humorous stories for grown-up kids, too. I just finished The Rosie Project and it was laugh out loud hilarious. Review written and coming soon! Have a restful weekend. What are you doing for FUN? That book sounds like so much fun! It looks like they have taken so much trouble to make it appealing by being a bit quirky. I shall have to remember this for when Leo is a bit older! I haven’t got any children so it’s hard to name a current children’s book, except for Harry Potter and Dr Seuss of course. I was an avid reader as soon as I learnt to read and my favourite children’s book was Stig of the Dump by Clive Owen. It was very popular here in the UK – I don’t know if it made it across the pond. 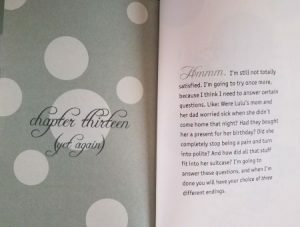 Oh, Lauren, Lulu is such a fun read. If you get a chance, check it out from the library. It will take you 5 minutes to read and it guarantees a smile.